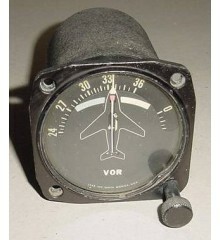 3 1/8" WWII Aircraft P-47 Thunderbolt Radio Magnetic Compass Indicator. Manufactured by Lear. P/N 63881A. It shows very well and it would make a great addition to a mock up panel or simply as a display item on the bookshelf or desk. Vintage 3 3/4" WWII Aircraft P-47 Thunderbolt Gyro Horizon indicator. Manufactured by Jack & Heintz. P/N JH6500-A or AN5736-1. Instrument face is a bit foggy as shown on photo. Sold for display only, as is, no returns.